The Birmingham native graduated from the University of Alabama and from medical school at the University of Alabama at Birmingham. He stayed in Birmingham for a six year surgical residency. “I love Knoxville,” he says. “It’s been a great place to live and raise a family.” The family includes wife Beverly, whom he met when both were attending the University of Alabama, and their three daughters, Lauren, age 32, Emily, age 30, and Jamie, age 28. Most recently the family has expanded to include 18 month old grandson James and 14-month old twin granddaughters Amelia and Eleann (known as Millie and Ellie). He recalls a pivotal moment early in his tenure at UTMC. 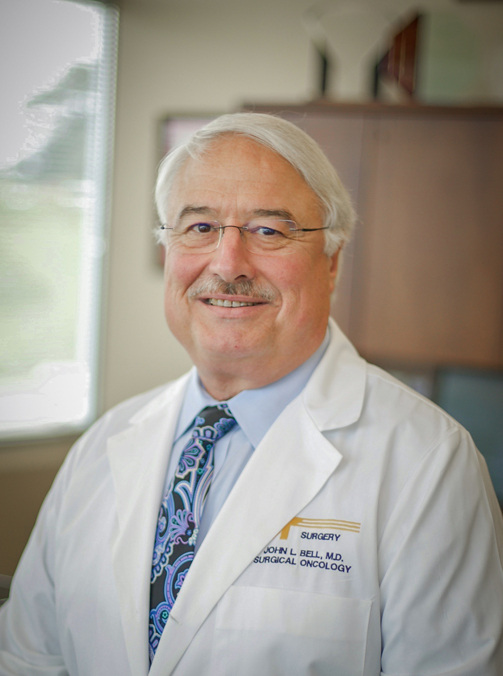 Dr. Bell selected breast cancer as his specialty. “The multidisciplinary conferences are a huge thing. Every day there are 30 doctors meeting about patients to determine the best course of treatment. Our goal is to have a plan for every patient within five business days. That’s huge.